I love wearing black but sometimes I find myself in a rut, a perpetual cycle of all black all the time. And while black IS a fabulous color (and totally slimming I might add), it can also be kind of depressing when worn 24/7. So it's times like those when I take it upon myself to inject a little sunshine into my wardrobe. Believe me, never underestimate the power of neon! Sometimes it's JUST what your spirits need. This brighter-than-the-sun sweater is almost blinding, which is why I love it! It's brilliant, attention-grabbing, and has the power to completely boost your energy when it's STILL winter outside. ...Ugh, can it be spring yet please? Plus, there's almost nothing that does a better job of letting you stand out in a crowd... which is pretty powerful when you're in a place as bustling as Grand Central Station. Skinny jeans are skinny jeans, right? That's what I though too before I spotted this unique pair of pants. These skinnies are high-waisted and totally flattering AND nothing goes better with them than a crop top. Why? They boast this attractive row of buttons at the top, which I can't get enough of. Seriously, they're just begging to be shown off! Cobalt is such a rich hue that it grounds neon and adds a definite sophistication to an otherwise youthful look. And at this point in the winter season, I am ALL about color. The more, the merrier! Adding a pop of brightness through a bag is a no-brainer way to experience an early spring. Alexis Bittar is one of my all-time favorite jewelry designers. This necklace is a piece I received for Christmas and I've been having a lot of fun wearing it since. I love how it's slightly edgy but also has a minimal aesthetic to it. And that gorgeous color? Striking yet neutral at the same time! 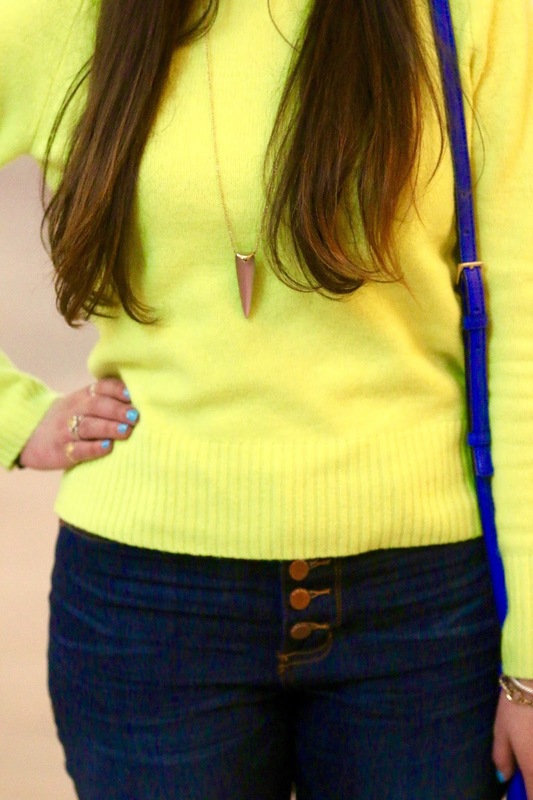 Since neon is the theme here, I played that up through my earring and nail polish choice as well as with my sweater. I'm loving bright blue for spring and it surprisingly compliments so many other colors! 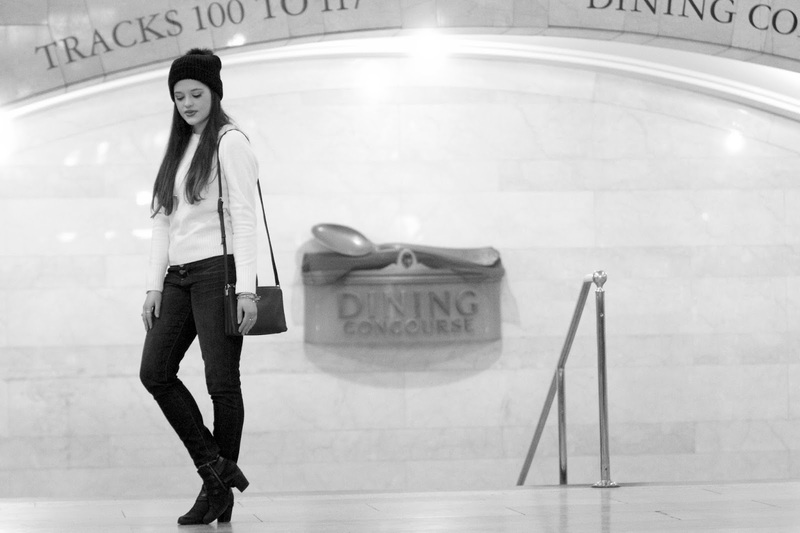 A super simple way to take your look to the next level is opting for heeled booties rather than flat ones. Now I love my Chelsea boots probably even more than the next girl does, but when I slip into a pair of heels, I instantly feel more elevated - both figuratively AND literally. Heels = polish, every time. My dad and I shot these photos last weekend on the coldest day of the year for New York. Believe me when I tell you I would have froze to death if we took these outside. It was brutal! 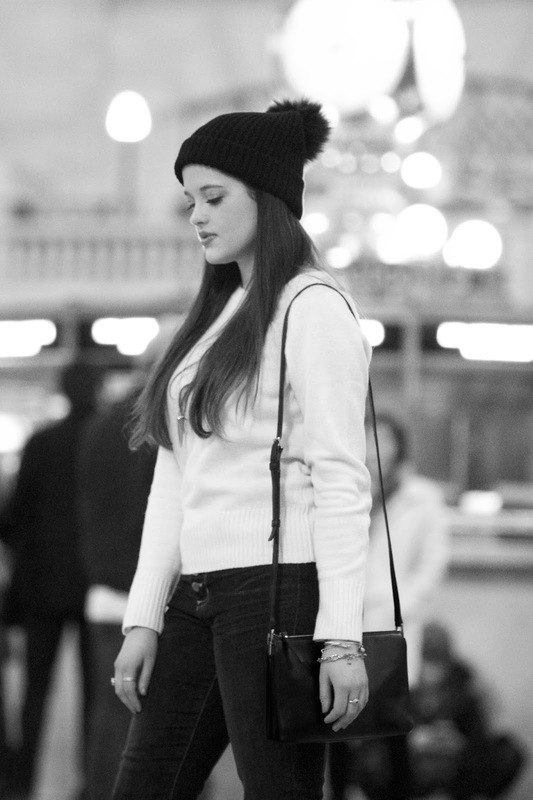 But we found a lovely setting in Grand Central Station so it's all good. Plus it was fun to see just how much I truly did stand out with my brights in a sea of black clothing. The weather here has warmed up since then but we still have some degrees to go until we're safely into spring territory. Until then I'll just keep rocking my neon and crossing my fingers for sunshine IRL. Fabulous color mixing! 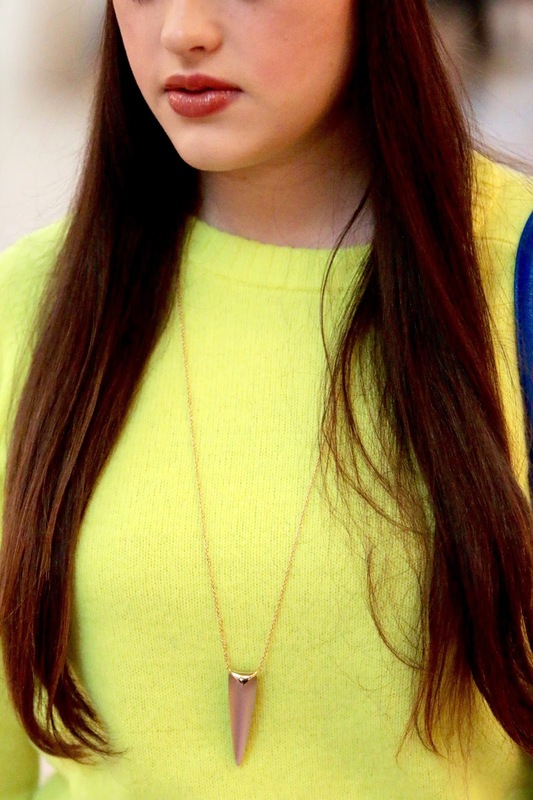 The neon yellow and blue go so well together totally brighten up the day! Amazing outfit,love the neon sweater with the blue bag,so colorful. That is such a gorgeous sweater and while I also love black...it is fun to spice things up with a bright piece like that too. I also think it's really awesome that you shot these photos in such a busy area. Basically one of my blogging fears! I love this! And yes it is definitely still chilly outside...but you make it fashionable! I love that sweater. I just love the neon yellow with the blue bag! I love how you stand out in the sea of black clothing behind you! And I love the yellow sweater and cobalt bag together! Amazing outfit! Very stylish! x.
I love that pop of color! And it looks so cozy! Fab color combo, love, love, love!!!!! 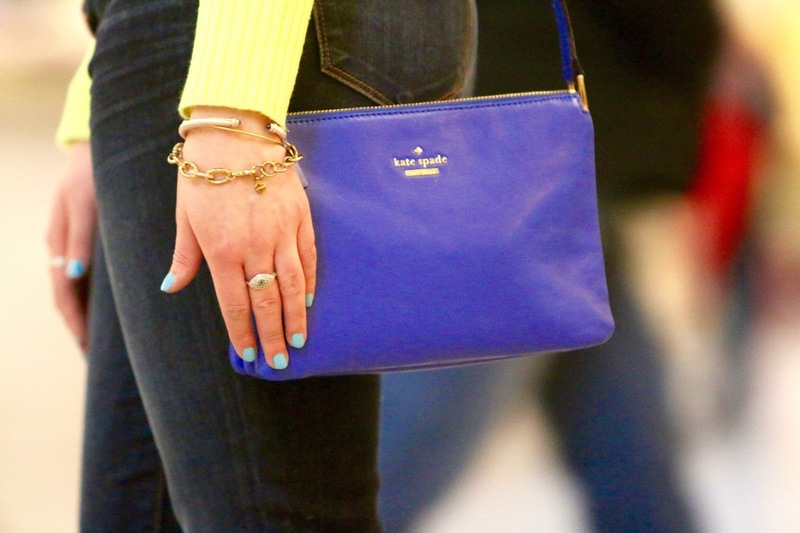 Such a fun pop of color, and I love it with your blue bag. This color is so gorgeous on you! You make the cold weather look so fabulous! Haha you are becoming a New Yorker if you find yourself wearing a lot of black, I hear you I am wearing all black today. And I will be passing through GC in about 20 mins on my way home from work! Great look! I love the bold pops of color! This color suit perfect on you dear! I love the yellow and cobalt together, perfection! what a cool and cozy look! love all the bright colors! cool beanie!